This past week, June Holley did a brown bag lunch at the Packard Foundation on network weaving and I was lucky enough to learn from her for a few hours! How would I describe June Holley? She's the guru of network weaving and walks on water. She gave a brilliant presentation that shared the story of footing binding in China and how using a networked approach and network weaving techniques, they were able to change the practice in a decade. 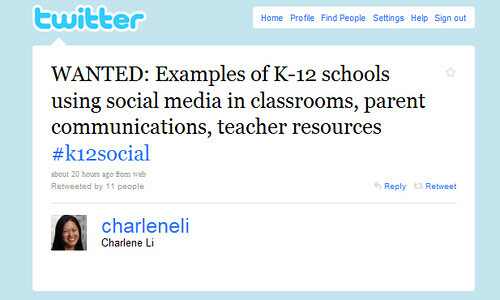 Charlene Li posted the above tweet looking for examples of social media in schools. I immediately thought of someone in my network, Vicky Davis, who writes the Coolcat Teacher blog. So I quickly made an introduction, thinking that they both come from different networks, but now could mutually benefit one another. My cc: to June Holley, was a little tongue and cheek or sort wink and node to the master that I was applying one of her lessons. Another master at social network analysis and network weaving, gave me some network weaving coaching from Twitter as well - saying that it was important to let everyone know the value of closing the triangle. So, decided to write this post! Thank you June for a fantastic and inspiring workshop! How are you weaving people in your network? Have a story? Great write up, Beth. I first met both Valdis and June about 15 years ago, in working on a project with the Kellogg Foundation on rural community use of the web to build/strengthen networks! They both taught me a huge amount on the topic and valdis' chart on neural networks is one of the few pieces of paper I keep around! I love using Twitter to connect people and ask for connections. I often look at influential people's "following" list to see who we have in common to get an introduction. This strategy has been very valuable for our organization in getting on the radar of bloggers and vaccine advocates. 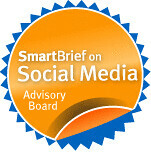 How do you find Twitter compares w other SM tools for this? Though I like Twitter, I find myself using LinkedIn more for this kind of "network weaving".